Ideally located at the centre of the Val d’Anniviers at a strategic crossroads where Lords and Squires have chosen to live since the 13th century, Vissoie is the valley’s medieval village. Vissoie, Niouc, Les Pontis, Soussillon, Les Barmes, Fang: strange names that arouse curiosity; surprising sounds that are witness to a past rich in history. 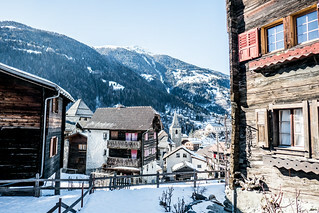 And there is no trace of a skier or frenetic sporting activity -only the profound silence of nature at rest and the special atmosphere of these little villages bursting with authenticity. Far from the hubbub of the valley resorts, these villages have made the most of their charm, so that they are now as ever considered the must-see places to go in the valley.